Problem: Marijuana loves Phosphorus and is unlikely to show signs of toxicity. It takes several weeks for a plant to start showing signs, and will mostly show signs of other nutrient deficiencies as the phosphorus locks up other nutrients. 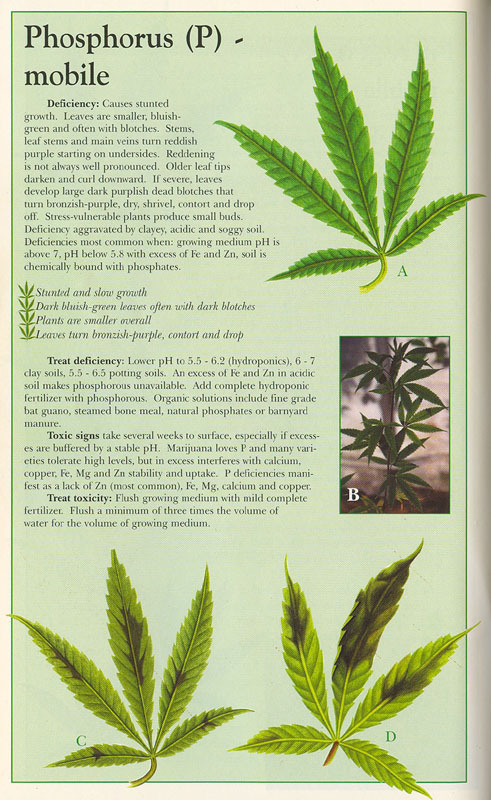 Click picture below for more information about phosphorus and your marijuana plant. Solution: If you maintain a proper pH, it's very unlikely you will overdose your plant with phosphorus. If you suspect your plant may have had too much phosphorus, the best thing to do is flush the plant with lots of clean, pH'd water at half nutrient levels.